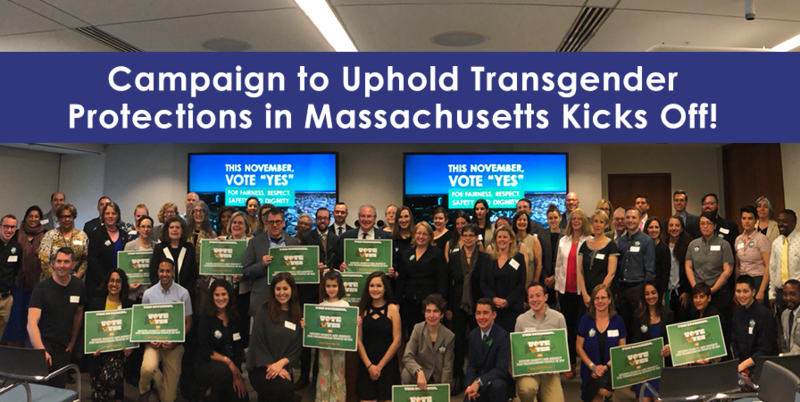 Freedom For All Massachusetts (FFAM), the bipartisan coalition committed to defend the Bay State’s existing transgender-inclusive nondiscrimination law at the ballot this November, officially launched their campaign today, showing already strong support from a broad coalition of organizations and individuals. Freedom For All Americans is proud to be a founding and leading member of FFAM — in addition to providing in-kind support and staff, including President of Strategy Kasey Suffredini serves as campaign co-chair. Protections for transgender people in Massachusetts have been on the books since 2016, when Republican Governor Charlie Baker signed a nondiscrimination bill ensuring basic protections in public spaces like restaurants, hotels and retail shops after wide support from civic, business, and cultural organizations as well as the voices of thousands of citizens. FFAM originally formed to help facilitate the passage of this legislation. However, in 2017, anti-LGBTQ activists began gathering signatures to petition the issue of public accommodations protections to the 2018 ballot; reaching the incredibly low threshold needed for certification, the question of full lived equality for transgender people has found its way to a public vote this November, making Massachusetts the first state in the country forced to go to the ballot box to defend the dignity of transgender people. I want to close with a message directly for transgender people in our Commonwealth, particular our transgender young people. On behalf of this coalition of thousands of voices in our Commonwealth, from every sector and every community, we see you, we know you are worth standing up for, and we will do everything we can to protect you. The heart of this Commonwealth is big enough to embrace all its residents, including those that happen to be transgender. Currently, Massachusetts is among 18 states and more than hundreds of municipalities with nondiscrimination protections for transgender people in public places, such as restaurants, shops, and medical offices. The law also protects transgender people from discrimination in public restrooms and locker rooms. Just last night New Hampshire passed a comprehensive nondiscrimination bill protecting transgender people – once the Governor signs the bill into law, it will become the 19th state with full protections. At today’s launch, the campaign announced is has already received the support and endorsement of over 1,000 organizations, law enforcement officials, sexual assault and domestic violence prevention experts, business leaders, members of the faith community, and more. Nearly every major university in the state is a member of the coalition, as well as every professional New England regional sports teams, including the New England Patriots, the Boston Celtics, and the Boston Red Sox. To help kick off the campaign, organizers across the state are holding door-to-door canvasses beginning on May 5, which will continue throughout the year. Several phone banking events, community meetings, and town halls are also planned as November inches closer. To learn more about the campaign, visit their newly revamped website here. To learn more about the history of nondiscrimination protections in Massachusetts, visit the Freedom for All Americans MA state page here.